Winner: 2014 IPPY Book Award, Bronze - Health, 2014 NIEA Indie Excellence Award, 2014 Association Media and Publishing EXCEL Award, Silver, 2014 National Health Information, Silver, Patient Education Information, 2013 USA Best Book Award, Health - Cancer ——— Offering encouragement and support, this updated guide is the authority on coping with breast cancer. Highlighting all the latest medical developments, from diagnosis through treatment and recovery, this essential book guides newly diagnosed patients every step of the way. 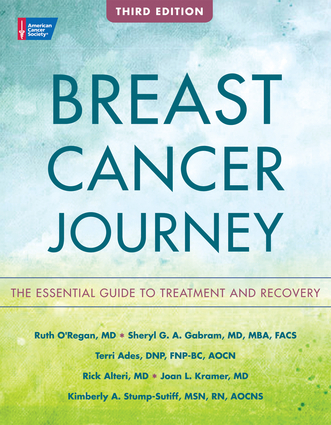 Including practical tips on managing the emotions, reactions, and side effects of breast cancer and its treatment, detailed questions to ask a medical team for empowerment, and wellness plans for recovery and life after cancer, this comprehensive manual is packed with information to best manage the breast cancer experience. Ruth O’Regan, MD, is a professor of hematology and medical oncology at Emory University and the chief of hematology and medical oncology at the Georgia Cancer Center for Excellence at Grady Memorial Hospital. Sheryl G. A. Gabram, MD, MBA, FACS, is the surgeon-in-chief for Grady Health System, principal investigator on the AVON Foundation grant, and director of the AVON Comprehensive Breast Center. She has been named by the patient resource guide, Castle Connolly, as one of America’s top cancer doctors for seven consecutive years. Terri Ades, DNP, FNP-BC, AOCN, is director of cancer information for the American Cancer Society. She is an expert in health literacy and certified as an advanced practice oncology nurse and family nurse practitioner. Rick Alteri, MD, is a medical editor at American Cancer Society. He helps maintain the Society’s database, the source of information for their website at the toll-free call center. Joan L. Kramer, MD, is a medical editor at American Cancer Society. She helps maintain the Society’s database and continues in clinical practice in the Breast Cancer Outpatient Clinic at Grady Memorial Hospital. Kimberly A. Stump-Sutliff, MSN, RN, AOCNS, is an associate medical editor at American Cancer Society. She is certified as an Advanced Oncology Clinical Nurse Specialist. They all live in Atlanta, Georgia.